Canada Mortgage and Housing Corp. is once again warning of "strong evidence of problematic conditions" in Canadian housing. That's not new — we've heard plenty of warnings about overvaluation in Toronto and Vancouver, and overbuilding in some Prairie cities. But this time, the mortgage insurer has flagged a different issue: The population of young first-time homebuyers isn't growing as quickly as it used to. "In the first quarter of this year, Canada saw a positive, yet slow growth in the young adult population and a drop in disposable income in all regions except British Columbia," CMHC's chief economist, Bob Dougan, said in its latest housing market assessment on Wednesday. "This gives less support to house prices, which picked up again in early 2017 after a period of decline in the back half of 2016." There aren't enough to young people buying their first homes in Canada today to justify current house prices, says Canada Mortgage and Housing Corp. While declining incomes are expected to be a temporary problem, the slower growth in Canada's youth population could prove to be a longer-term problem — that, according to some analysts, could keep downward pressure on Canada's housing markets for years to come. In a 2014 report, the Bank of Montreal (BMO) warned of a steep decline in the first-time, home-buying age cohort (defined by the bank as 25 to 34 years old), starting around 2016. That would start to put pressure on the housing market around 2018, economist Robert Kavcic predicted. The bank's projections show an outright decline in the youth population starting around 2020, which could further erode the demand for housing. Kavcic noted that the last time this age group was shrinking, in the 1990s, Canada's housing market went through a prolonged downturn. 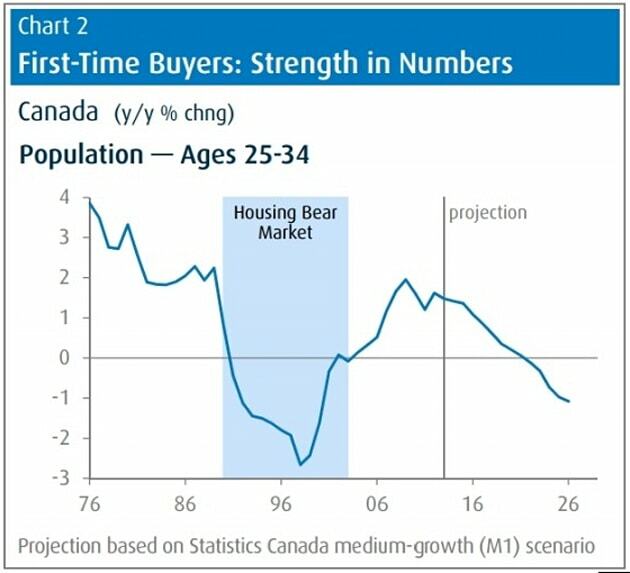 This chart shows the population of first-time homebuyers (aged 25 to 34) is slowing in growth in Canada today, and will begin declining around 2020. A similar period of declining youth population was seen in the 1990s, when Canada's housing markets were in a protracted slump. The lack of young people to buy homes in the coming years could again push the housing market into a protracted slump, BMO warned. The CMHC report singled out Toronto, Hamilton, Vancouver and Victoria as having "strong evidence" of overvaluation in house prices, while Quebec City and Saskatoon have "moderate" evidence of overvaluation. The report also saw "strong evidence" of overbuilding in Regina and Saskatoon, and "moderate" overbuilding in Calgary, Edmonton and Winnipeg.